Tis' the season for holiday parties, family get togethers, and more! I love spending time with all of the special people in my life, and I can't think of a better way to do that than around a table with a great meal! The thing is, with all the shopping and meal planning for the big day, my pocketbook doesn't always allow for pricey cuts of meat and expensive wines. That's when I turn to my pantry for inspiration. 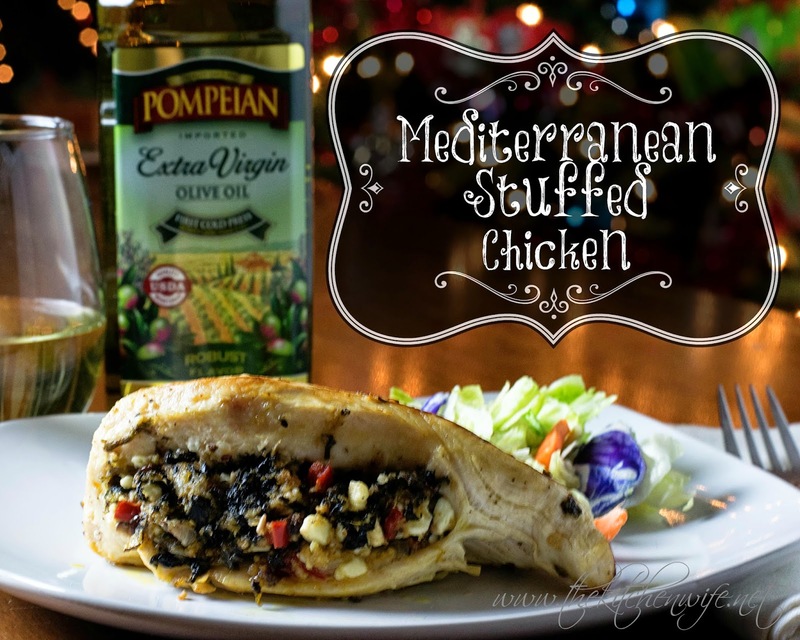 Using an inexpensive cut of meat, such as chicken, a few staples, and a good quality oil such as Pompeian Extra Virgin Olive Oil, you can whip up this AMAZING Mediterranean Stuffed Chicken in no time! 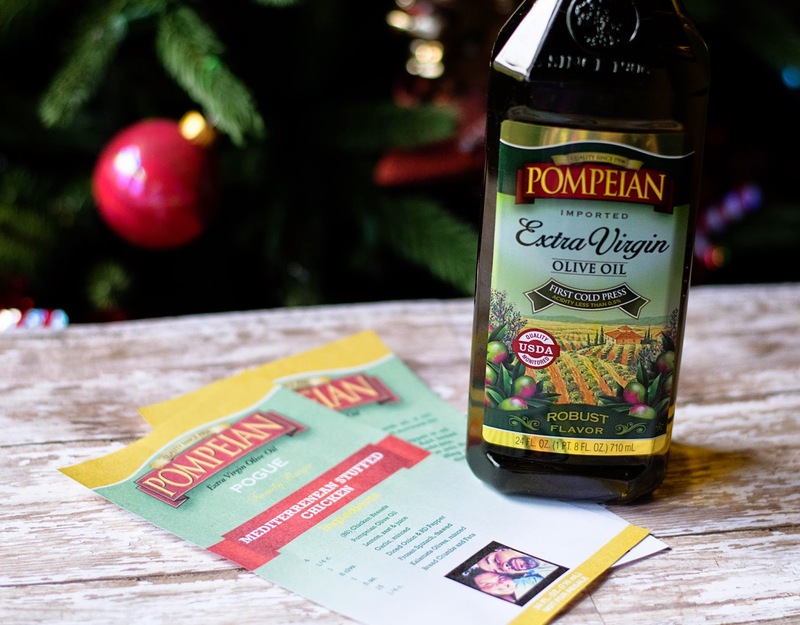 Oh, and did I mention that in addition to being the first and only extra virgin olive oil to carry the USDA quality monitored seal, Pompeian has a wide variety of products including blended oils, vinegar, cooking wines and cooking sprays for all of your holiday cooking needs. I not only want the filling of this chicken to be great, but I want the chicken itself to be moist and flavorful as well. To do this I am going to infuse the Pompeian Extra Virgin Olive Oil with a few Mediterranean flavors. To begin, place a small skillet over a medium/low heat. Next, add the Pompeian Extra Virgin Olive Oil to the skillet. To the oil, add the garlic. After you have zested your lemon squeeze the juice into your oil. Also to the oil, add 1 tsp. of oregano. Now let this steep for about 5 minutes over the heat. This will really help these great flavors come together. While you are letting the oil cool, place your chicken breasts into a resealable bag and sprinkle with salt and pepper. Next pour the infused oil over the chicken. Now, press the air out of the bag, seal it, and place in the fridge for 30 minutes to overnight and marinate. While the chicken is marinating we are going to preheat the oven to 375 degrees and begin our stuffing. Add a little more of the Pompeian Extra Virgin Olive Oil to the skillet. Oh, before I forget, it is ALWAYS best to have everything prepped and ready to go. You're going to save yourself A LOT of stress this way. To the oil you will add the onion and cook until soft and translucent, about 3-5 minutes. After that, add the red bell pepper. Again cook until the pepper begins to soften. Stir and saute for 3-5 minutes. Because we have olives in this stuffing and we will be adding feta, you won't need to add any more salt, but remember TASTE IT! You may want to adjust the seasoning to your liking. Place all the ingredients into a separate bowl and allow to cool for about 10 minutes. Drizzle with a little more Pompeian Extra Virgin Olive Oil, stir, and the filling is complete! Now it is time to stuff the chicken breasts. Remove from the marinade and place on a cutting board with the thickest side of the chicken facing you. Using a pairing knife, make a deep slit into the side of the chicken. Then gently cut into the breast a little more, being careful not to cut through the other side, until you have a nice, deep pocket. Place the skillet you made the stuffing in over a medium/high heat and add a little more Pompeian Extra Virgin Olive Oil. Then put in your preheated oven. After 25 minutes remove from oven and let rest for a few minutes. And there it is! 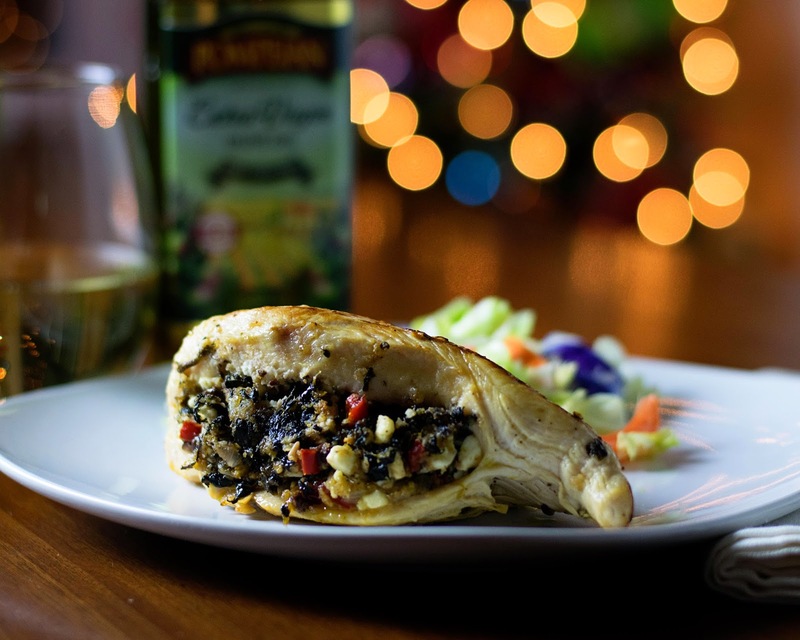 This stunning, succulent, flavorful, and festive Mediterranean Stuffed Chicken perfect for those casual holiday dinners! You can serve this with a nice, light salad, and maybe some roasted garlic mashed potatoes. I promise your friends and loved ones are going to rave about the dish and be begging for the recipe! This is perfect because, just in time for the 2014 holiday season, Pompeian is helping you share those cherished recipes by offering personalized bottles that you can place your family recipe along with a family photo! It's a perfect parting gift for any holiday celebration! Simply head on over to Pompeian's Facebook Page Where you can personalize your very own label, print it off, and customize a bottle for each one of your guests! They are sure to love it! So don't stress about these holiday get-togethers and what you are going to buy for your friends this season! Pompeian and I have you covered. Heat 1/2 c. olive oil over medium/low heat. Add the garlic, juice of one lemon, and oregano. Allow to steep for 5 minutes then pour into measuring up to cool. Place the chicken breasts into a resealable bag and sprinkle with salt and pepper. Pour the marinade over the chicken, press the air out of the bag, seal, and place in the refrigerator for 30 minutes to overnight. Add 3-2 tbsp. of extra virgin olive oil to a skillet, placed over medium/high heat and preheat the oven to 375 degrees. To the skillet, add the onions and saute until soft and translucent. Add the red bell pepper to the skillet and saute until soft as well. Then add the olives, garlic, spinach, & lemon zest. Saute for 3-5 minutes. Now add the chili flake and a little pepper. Place the filling into a bowl to cool. Once cooled, add the bread crumbs and feta, then stir together. After the filling is finished, remove the chicken from the refrigerator and, using a pairing knife, cut a pocket into the thickest side of the chicken. Fill the pocket with the filling and press close. Heat the skillet over medium/high heat and add a little more olive oil. Place the stuffed chicken breast in the skillet and brown on both sides. Next place in a baking dish and into a preheated oven for 25 minutes.